Fewer combinations make the world raise an eyebrow at the standard American diet more than the peanut butter and jelly sandwich. It’s a staple of the diet of kids aged 5 and under, but let’s be honest – when there’s a good glob of peanut butter, a thick layer of jelly, and a good loaf of bread supporting this combination, it really is culinary heaven. Any old peanut butter and jelly sandwich is fairly decent by itself. A basic sandwich in our house involves the cheap $1 loaf of bread, generic chunky peanut butter, and the big jar of grape jelly that’s less than two bucks that you sometimes have to ask the store manager to bring out because they don’t like stocking it. It’s good… but it’s not great. For the very best in peanut butter and jelly, you might think that you’ve got to go upscale, but you don’t. You can actually put together the perfect sandwich for less than $2 per serving! Obviously this is all subjective and I’m certain there will be disagreement, but here’s the perfect peanut butter and jelly sandwich. Everyone has their favorite kind of jelly and/or preserves: strawberry, grape, orange marmalade, peach… they’re all good choices. For the perfect sandwich, however, I had to take a trip down to the local Irish import store to pick up a jar. 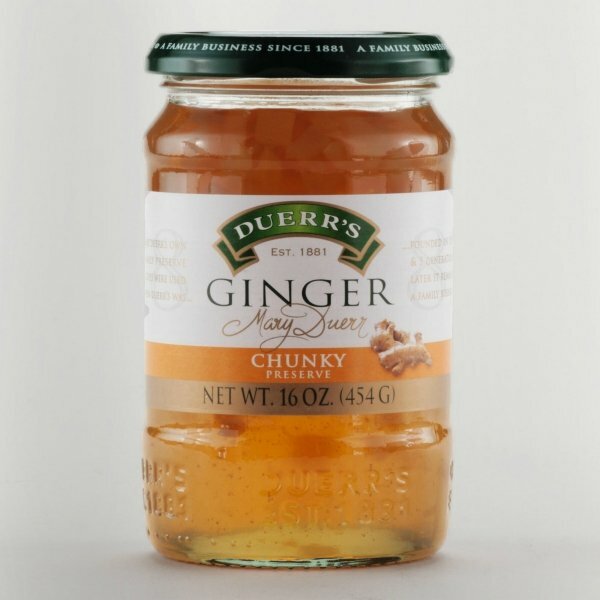 It’s Duerr’s chunky ginger and they’re not lying when they describe it as “chunky.” The chunks in it are nice and thick, but the flavor of the ginger isn’t overpowering and it compliments the peanut butter very well. The spicy version the preserves work in a pinch, but you tend to lose the subtlety of the flavors with the other varieties or with a ginger marmalade. My doctor says that I’m supposed to be gluten-free and for the most part I do a pretty good job of following instructions. When it comes to gluten-free bread, however, it just doesn’t stand up to the weight of the perfect sandwich. It crumbles, becomes a mess, and even the dogs won’t lick up the crumbs from the floor. 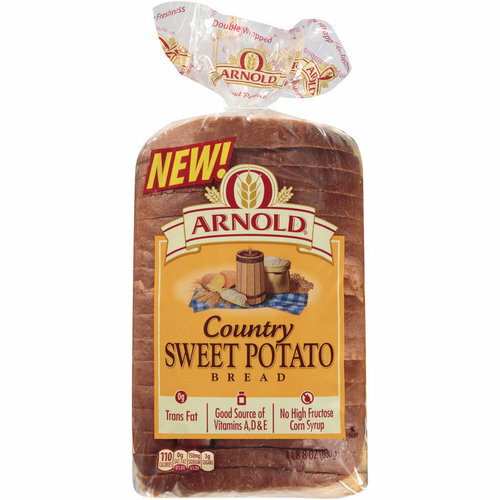 For the purest who wants to bake their own bread, Bob’s Red Mill potato loaf mix is one of the faster ways to get a good loaf, but equally good and much faster is Arnold’s sweet potato bread. The next thing you’ve got to do is get some butter melted. At the same time you’re going to want to heat up a skillet. I prefer an iron skillet for this, but even a large frying pan with a flat bottom will work. Melt the butter not in the pan, but in the microwave. Heat up the pan like you’re going to sear meat while you’re melting the butter. You want it nice and hot, but not smoking. Brush the melted butter on just one side of the bread and then quickly flash toast the buttered side of the bread. This admittedly takes some practice. It will literally be done in 1 second flat. Too long and you’ve burnt your expensive and potentially homemade bread. Too fast and the butter congeals into this kind of lumpy, fatty ickiness. Perfection gives you a caramelized brown crust that traps the butter flavor inside the bread itself. Do both slices this way. Now I know this isn’t exactly fair, I have a little machine at the grocery store that lets me buy a pound of peanuts and instantly grind it down into peanut butter naturally. That’s the best method by far for this sandwich! You can grind your own at home if you have a high quality blender or food processor – in a pinch I’ve used a Ninja. 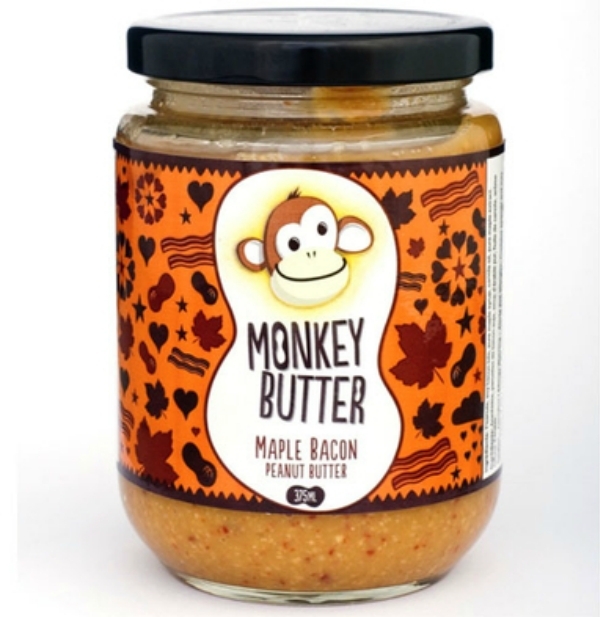 To make the perfect sandwich, however, I need to go outside of the country and invest in some maple bacon Monkey Butter. Spread the Monkey Butter on nice and thick, then carefully spread the ginger preserves because it’s thick and the chunks of ginger can cause the bread to tear. If you do it all within a couple minutes of toast searing the bread, you’ll have just enough warmth to create the most amazing flavor combination. 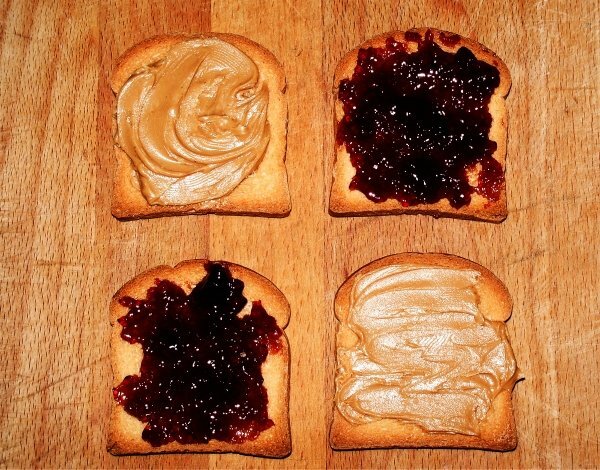 So that’s my perfect PB&J… how do you make your perfect sandwich?